We Just Flew Past a Kuiper Belt Object. Here's Why We Should Do It Again. 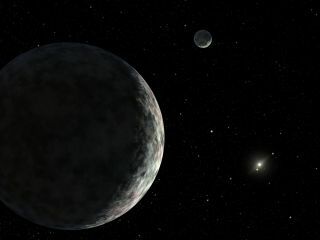 An artist's depiction of Eris, a dwarf planet far beyond the Kuiper Belt that an interstellar probe could study, seen here with its moon, Dysnomia. Kuiper Belt objects like the one New Horizons just flew past are a dime a dozen, but scientists have detailed spacecraft observations of just three such distant, frozen worlds. It may take an already-proposed high-speed mission to add new objects to that list. That potential mission would speed through the solar system, covering 20 astronomical units (AU) each year (an AU is the average distance between the sun and Earth, or 93 million miles or 150 million kilometers). The mission has a host of scientific goals, but one key activity such a mission could tackle would be looking at objects in the outer solar system. The proposed interstellar probe itself is a suggestion that's been kicking around for a while now. The idea is that the team could use existing and near-term technology, and rely on speed boosted by a sequence of gravity assists, to send a spacecraft racing across the solar system faster than any vessel to date. That sort of speed is great for impatient scientists, but it also poses serious challenges. The faster a spacecraft travels, the more carefully instruments need to be designed to gather data, like images, without blurring the results. So, Mandt and her colleagues are looking at the Long Range Reconnaissance Imager, or LORRI, instrument, a paired telescope and camera currently flying on New Horizons. That instrument captured both the initial images of Pluto and 2014 MU69 that helped the team navigate the spacecraft and some the later, high-resolution images of the surface of Pluto. But LORRI would need to be upgraded to successfully snap sharp images at the higher speeds of an interstellar probe. An instrument that could gather surface spectra, which scientists use to identify what materials are found where, would also be incredibly valuable, Mandt said. Once instruments are set, it's a matter of picking a dream destination — or several. Mandt and other team members have studied how potential targets will align, assuming the probe could launch by 2030 as desired. That means looking at a whole host of Kuiper Belt objects found beyond Neptune's orbit. Take, for example, Quaoar, a Kuiper Belt object that's about half as wide as Pluto. Scientists have spotted the signature of methane on this object's surface, which could mean it still clings to a thin atmosphere. But scientists aren't sure how much Quaoar resembles its larger, more famous cousin. And Quaoar is just one potential large target. "I would love to do a flyby of Eris, because it's similar in size to Pluto but farther out in the solar system," Mandt said. In particular, she would want to pursue planetology, investigating how Eris matches or differs from Pluto. She'd want to be able to answer questions like whether Eris has an atmosphere and what volatile elements are still at its surface, if any, she said. And adding close-up observations of simply any trans-Neptunian object could be an improvement over our current knowledge. Consider New Horizons' Jan. 1 flyby of a Kuiper Belt object called 2014 MU69 and nicknamed Ultima Thule. That destination was chosen mostly because the spacecraft could reach the object with remaining fuel, yet the world has offered plenty of intriguing science puzzles. An interstellar probe wouldn't solely be devoted to planetary science, of course. It would also tackle questions about the heliosphere, the bubble surrounding our solar system produced by charged particles streaming off the sun. While we've seen similar bubbles around other stars, we've never seen our own heliosphere from outside. But before such a probe passed that boundary, there would be new worlds to explore.